I have three charts for you today. They are all indicative of SOMETHING BIG. And if you place bets on the right side of those market moves, you can do very well. Heck, you could even get rich. First, we know that oil prices are supposed to tank, because the Saudis are opening the taps after a scolding from President Trump, right? Well, total world oil output rose to 100.9 million barrels per day (bpd) in June. That’s up more than a million bpd from May. However, that’s barely above total oil demand of 99.1 million bpd. Demand that is growing. And this is when total OECD oil stockpiles are 2% below the five-year average. That’s too close for comfort. Too close for oil prices to do more than dip. Well, U.S. production can make up the difference, right? After all, the U.S. is supposed to pass Saudi Arabia in oil production this year. U.S. oil production was recently at 9.9 million bpd, mainly on strength of production in the Permian Basin. • See, if you produce the oil, how do you get it to market? It turns out many new pipeline projects are depending on foreign steel. That’s where the thick steel grades are produced. That steel is now facing a 25% hike in tariffs! • Plains All American Pipeline (NYSE: PAA) recently requested an exemption for its new Cactus II pipeline to move oil out of the Permian. It was denied. • Kinder Morgan (NYSE: KMI) and Williams Co. (NYSE: WMB) are also asking for exemptions. Good luck, amigos! 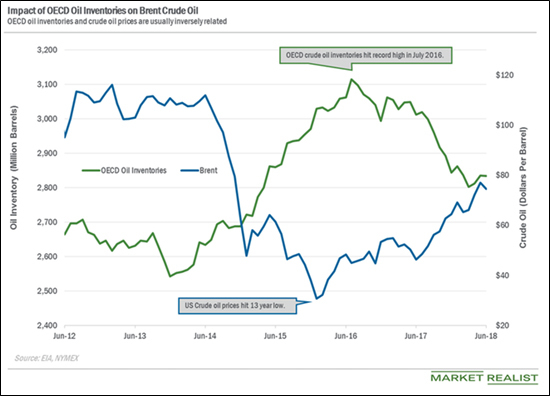 In fact, rising tariffs could raise heck with all sorts of oil production expectations. Not just here, but all over the world. This means tighter oil production than expected. And that means higher prices. Your profit play: Buy stocks of select oil producers, services companies and pipelines. Speculators can short KMI and WMB. I’ve pounded the table about uranium prices. I’ve told you that you should get ready for a HUGE move. In fact, the price of uranium is up again this week! The white-hot metal is up about 16% from its April lows. But now, the U.S. government is picking winners and losers. A case is being decided right now by the Commerce Department. Two U.S. uranium producers have asked the government to “level the playing field” by forcing U.S. utilities to source more of their uranium from U.S. mines. We can debate whether this is good or bad. The fact is, it’s coming. And wouldn’t you know it, U.S. uranium companies are starting to outperform in a big way. 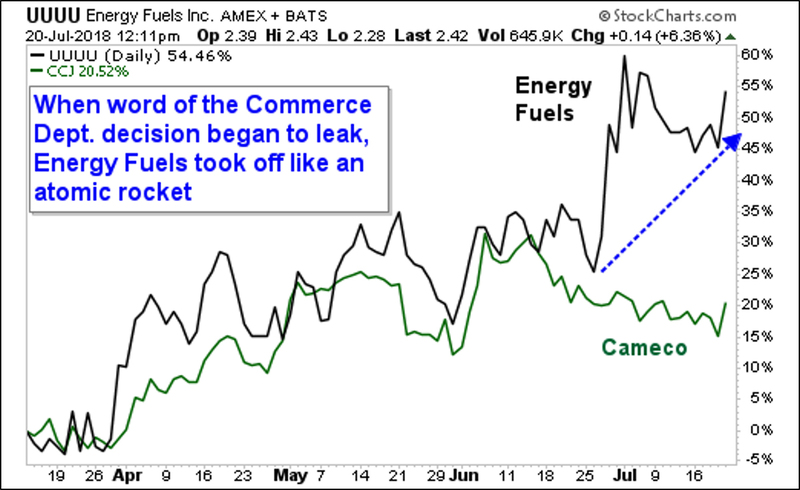 Here’s what Energy Fuels (NYSE: UUUU) is doing compared to Cameco (CCJ). Cameco is a Canadian company, and the biggest uranium producer in the free world. The “Saudi Arabia” of uranium, if you will. So, it should be going higher with prices. 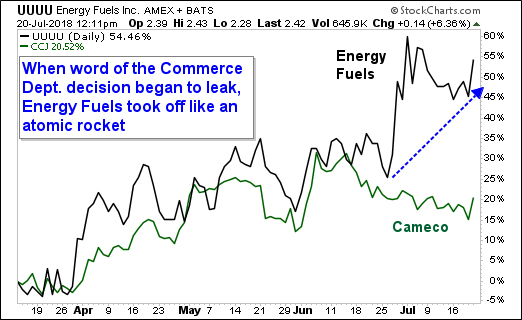 What’s interesting is the fact that money is pouring into tiny Energy Fuels. This shows us that the market is anticipating even more good news in uranium-land. My Wealth Supercycle subscribers own both companies. And here’s a secret most people don’t know: While Cameco is mainly Canadian, it also has uranium mines in Wyoming. They’re shut down now, waiting for higher prices. Or maybe waiting for a shift in the political winds. Either way, they are ready to open their doors when the time is right. In fact, there is a short list of companies with U.S. uranium projects. I think those companies have extraordinary potential. I’ll be telling my subscribers about them soon. Your profit play: Buy American uranium stocks. Not sold on the uranium story just yet? Watch my three-part video series with Dr. Martin Weiss, “Financial Judgement Day: Stunning Predictions for 2018-2022,” and you’ll see why this is one of 14 investments that’s destined to soar. Watch these FREE videos here. Solar stocks are down 15% from highs hit in May. Many investors are expecting a second wind. 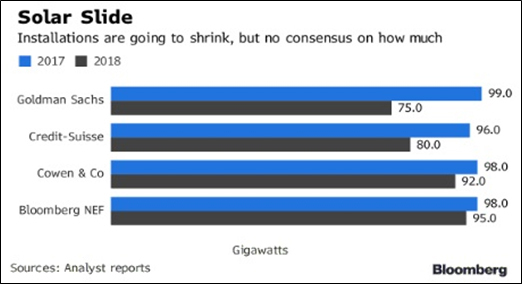 Every major analyst predicts that solar installations globally will fall this year. Goldman Sachs says the drop will be 24%; other opinions differ. This isn’t just because the Trump administration is indifferent to solar. It’s because China announced in late May it was curbing utility-scale development. The government there pulled the plug on about 20 gigawatts of projects. Ouch! This will take months to work out. For now, give solar a pass. Your profit play: Avoid solar. Invest in some good sunscreen instead — it’s hot out there! Those are three ideas that can help you profit going forward. The second half of 2018 looks to be very volatile, with geopolitics, tariffs and tweets from hell pushing the markets around. But you can still make a heck of a lot of money.